LMD WebPack is a collection of 10 native VCL components that can be compiled into your application royalty free. The included controls help you to integrate advanced webbased features like applications updates via internet, display of news items, scanning of web sites or single HTML pages. Two internet access frameworks (MS WinInet or Indy) are supported. Release 4.0 introduced integration into the LMD shared runtime packages and improved VCL.NET compatibility. 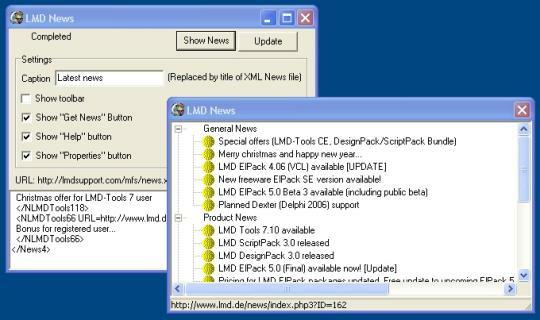 TLMDWebAutoUpdate completely reworked and updated. New: TLMDUpdateAdapter - Adapter provides the LMDAutoUpdate application, LMDUpdateForm - component to visualize update process. Windows Vista support “as Invoker” added. This is a LMD 2018 release and should not be used at the same time with older release packages.